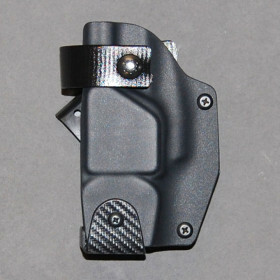 Enforcer Kydex Holster (L2) » Protective Solutions, Inc.
Top quality Speed Draw Kydex holster with Level 2 active retention. Custom-made specifically for the PhaZZer Enforcer CEW, made in the USA. Specify Right or Left (image shows Right). Optional molle/malice clips available separately. - Adjustable to either Straight Draw or Cross Draw position. - Standard fit for belt loops. - For molle carrier loops, add "molle adapter" to order.